The Gallery’s collection of art from the ancient Mediterranean world comprises over 13,000 objects from the Near East, Egypt, Greece, Etruria, and Rome. The collection is also known for its important finds from Yale University’s excavations in the 1920s and 1930s at Dura-Europos (in present-day Syria) and at Gerasa (now Jerash, Jordan). The Yale University Art Gallery’s collection of ancient Mediterranean art is displayed in the graceful Sculpture Hall in the 1928 Old Yale Art Gallery building, the chronological installation moving from ancient Babylon through early medieval Europe. Visitors first encounter objects representing the ancient Near East, including Assyrian stone reliefs from the palace of the ninth-century B.C. King Assurnasirpal II, followed by vases, glass, sculptures, and mosaics from the Greek and Roman civilizations. In particular, the display features the Gallery’s strong collection of Classical Greek vases, as well as private and imperial Roman portraits. 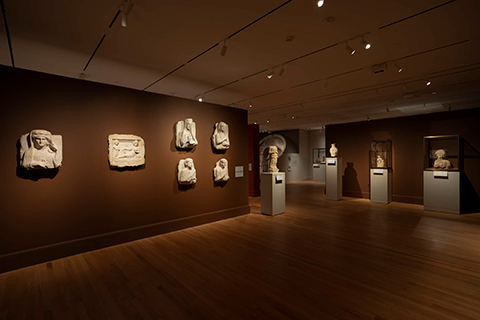 The installation also includes an important gallery devoted to Yale’s finds from ancient Dura-Europos, in Syria. Excavations in the 1920s and 1930s uncovered what is likely the earliest Christian church, a synagogue whose assembly-room walls were painted with biblical scenes, and a shrine to the mysterious Roman god Mithras. Many other pagan religious sanctuaries surfaced, reflecting the multicultural nature of religious communities in the Roman provinces. Also discovered were paintings, sculptures, papyri and parchments, coins, arms and armor, and items of daily use, such as leather sandals, jewelry, and textiles. The extraordinary sculptures found at Dura-Europos are presented together with works from nearby Palmyra, asserting the close connections and exchanges between the two cities. Other highlights include a full-scale reconstruction of the Mithraeum, wall paintings from the baptistery in the Christian church (including what is among the earliest known images of Christ), decorated ceiling tiles from the synagogue, and rare examples of military equipment (including a complete set of horse armor and painted wooden shields). At the same time as the Dura excavations, Yale also participated in excavations at Gerasa, whose mosaics represent the best of early Byzantine church-mosaic production in Jordan. One of the Gallery’s most important objects is a spectacular sixth-century A.D. floor mosaic with isometric images of the Egyptian cities of Alexandria and Memphis, which had been in storage since the 1940s. An innovative conservation treatment was recently completed, allowing the mosaic to be a highlight of the Gallery’s ancient Mediterranean installation. The recently reinstalled Mary and James Ottaway Gallery of Ancient Dura-Europos offers a new perspective on this ancient city, located on the Euphrates River in present-day Syria. Emphasizing the strong cultural and commercial ties between Dura and neighboring Palmyra, the new display features extraordinary sculptures from the 1st to the 3rd century A.D. The gallery showcases the art and artifacts excavated at Dura-Europos during the Yale-French archaeological campaign in the 1920s and 1930s. A related online feature explores Dura through photographs and field records that provide archaeological context for the remarkably preserved objects of daily life discovered at the site. The new installation focuses on sculpture from Dura and Palmyra and provides an understanding of intercultural relations in the ancient Roman Near East. The objects link the two cities and their communities through a common style and technique, iconography, and even stone. Through the sculptures on view—which include funerary portraits, freestanding statues, and cult reliefs—the installation allows visitors to connect with ancient individuals, face-to-face; such connections are increasingly important and poignant in light of the recent destruction of cultural heritage in Syria. in New York at the Metropolitan Museum of Art. Baird, J. A. “Photographing Dura-Europos, 1928–1937: An Archaeology of the Archive.” American Journal of Archaeology 115 (July 2011): 427­–46. Baur, Paul V. C., ed. Gerasa: City of Decapolis. New Haven: American Schools of Oriental Research, 1938. Brody, Lisa R. “Portrait of a Lady: A New Statue at the Yale University Art Gallery.” Yale University Art Gallery Bulletin (2008) 143–47. Brody, Lisa R., and Gail L. Hoffman, eds. Dura-Europos: Crossroads of Antiquity, exh. cat. Chestnut Hill, Mass. : McMullen Museum of Art, Boston College, 2011. Brody, Lisa R., and Carol Snow. “A Mystery in Marble: Examining a Portrait Statue through Science and Art.” Yale University Art Gallery Bulletin (2010): 31­–45. The Excavations at Dura-Europos, Preliminary and Final Reports. New Haven: Yale University Press; Los Angeles: University of California Press; Ann Arbor: University of Michigan Press, 1929–2001. Grossmann, Richard A. Ancient Glass: A Guide to the Yale Collection. New Haven: Yale University Art Gallery, 2002. Harrelson, Sam. Asia Has Claims Upon New England: Assyrian Reliefs at Yale. New Haven: Yale University Art Gallery, 2006. Hopkins, Clark. The Discovery of Dura-Europos. Edited by Bernard Goldman. New Haven: Yale University Press, 1979. Matheson, Susan B. Corpus Vasorum Antiquorum: Athenian Red-figure and White-ground Vases in the Yale University Art Gallery. Mainz-am-Rhein, Germany: von Zabern, 2011. Matheson, Susan B. Greek Vases: A Guide to the Yale Collection. New Haven: Yale University Art Gallery, 1988. Matheson, Susan B. Ancient Glass in the Yale University Art Gallery. New Haven: Yale University Art Gallery, 1980. McCarty, Matthew M. Ancient Bronzes: A Guide to the Yale Collection. New Haven: Yale University Art Gallery, 2006. Scott, Gerry D. III. Ancient Egyptian Art at Yale. New Haven: Yale University Art Gallery, 1986.